How do you fight and win with one hand tied behind your back? U.S. and South Korean officials would do well to figure out, quickly. A dark cloud descended over the Korean Peninsula last week as a series of North Korean actions along the DMZ escalated tensions to the highest level since 2010. Despite ongoing talks between the two sides, tensions remain high. The prospect of limited war on the Korean Peninsula is all too real, and the alliance must reorient its preparations accordingly. I’ve spent most of my tenure since leaving government warning about limited war in Korea—a conflict in which both sides avoid nuclear exchanges, no invasion of Pyongyang occurs, and both sides limit their objectives and the means of attaining them to eschew conquest. In limited war, a return to the status quo may count as a victory. If that sounds perverse, it’s because we’ve become accustomed to an image of war as an all-or-nothing affair; no goal short of total enemy surrender will do. Not so in a world of limited wars. I raised this issue in congressional testimony earlier this year. I noted it in subsequent op-eds, and in a Center for a New American Security report for Secretary of Defense Ash Carter. I’ve discussed it before the media, and at conferences. And in a forthcoming report for the U.S.-Korea Institute, I attempt to sketch how the alliance might adjust to a future of limited wars. The most recent mini-crisis brings the point home in disturbingly clear fashion: the risk of limited war on the Korean Peninsula is increasing with time. I’ve identified a number of mutually reinforcing reasons why this is so, and why the reality of limited war actually gets more likely with time. Every Korea expert I’ve ever met believes North Korea’s primary goal is regime survival. Yet most of these same experts believe that Kim Jong-un is capable of anything and there’s no telling what he might do. To put it politely, that’s cognitive dissonance. If we know North Korea seeks regime survival, then we know something about what it’s keen to avoid. Even Kim Jong-un must know there are certain actions that would end him and his regime—nuclear attacks, the destruction of Seoul, or a mass invasion of South Korea. Kim Jong-un isn’t a Millenarian or a Jihadi; his goal isn’t suicide. So unless we want to shrug our shoulders and say “anything could happen,” we should have some modest confidence that Kim won’t pursue the extreme actions that North Korean media routinely threaten. South of the DMZ, the incentives to avoid a nuclear conflict are just as strong. For starters, 60 years of “restraint” when faced with North Korean violence suggests that, in the United States especially, there is a strong desire to avoid the risks of escalation and conflict in general. Plus, no sitting president—American or South Korean—wants to go down in history as the first president to usher in the era of nuclear warfighting. The cost in lives would be abhorrent, and there’s a high risk that such a situation would rapidly erode the nuclear nonproliferation regime. In June 1950, North Korea launched a large-scale invasion of a South Korea with only a token ability to resist and no meaningful U.S. military presence. This is the classic scenario that experts and military planners often imagine when they think of another Korean War. Yet there’s now a heavily armed DMZ—replete with a large minefield, no less—separating the North and South, and the South Korean military is better trained and equipped than any force North Korea could muster. North Korea’s air force and navy services are vastly inferior to the technologically advanced South Korean military. And the U.S. military presence in and commitment to South Korea is far more than symbolic. The point is that no military leader would look at the military balance on the Korean Peninsula—especially not a leader in the North Korean People’s Army (KPA)—and think that it makes sense for North Korea to invade South Korea. The former might have cause for conflict, but waged asymmetrically, not as a head-on frontal assault. Invasion of the South is militarily impossible. 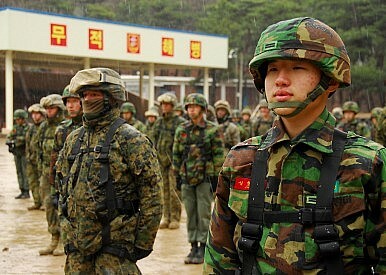 This North-South military imbalance is worsened by a KPA that lacks the logistics and sustainment capacity required of an invasion; the KPA is numerically large, but regularly diverted from military tasks to perform agricultural and industrial labor functions to support a moribund economy. The KPA isn’t a force that’s capable of a long duration military campaign. While there are few, if any, reasons to expect a North Korean conquest over the South, the converse is equally unlikely. Any invasion of North Korea would be slow and costly, offering both sides many opportunities to either “pause” and de-escalate conflict, or escalate to total devastation. First, invading North Korea guarantees the mass artillery shelling of Seoul, South Korea’s capital, and North Korea’s use of “battlefield” chemical weapons at scale. If the alliance is invading, there’s no reason for North Korea to refrain from taking these actions. Second, moving large numbers of troops into North Korea requires not only facing down an adversary with home field advantage, but a topography that’s entirely inhospitable to outside invasion—highly mountainous, lots of underground facilities and tunnels, and with very little infrastructure such as roads and bridges to exploit. Third, because North Korea’s local advantages would dramatically slow the progress of a northward march, North Korea would have plenty of time to confirm that its regime is facing extinction, which increases incentives to launch nuclear strikes. Applied to the Korea situation, two concepts in political science also bear on incentives for limited conflict: audience costs and the stability-instability paradox. Audience costs are the expected punishments or rewards a leader is likely to face based on their behavior. In democracies, domestic audience costs are thought to sometimes encourage restraint in political leaders, and to strengthen the credibility of threats when leaders of democratic polities make them. A politician who fails to live up to their word, for example, will be punished at the ballot box (this is a theory, not a description of reality). In dictatorships though, the audience cost mechanism as a source of either restraint or credibility doesn’t exist in the same way. The only audiences that might punish or reward a leader are elites who implement orders and are capable of threatening a coup. But in North Korea, Kim Jong-un seems to be killing all those guys. So even if dictators face audience costs in general—and many scholars think they don’t—North Korea seems a special case in which audience costs are marginal if they exist at all. So if North Korea ends up in an undesirable conflict, Kim Jong-un and the generals can de-escalate or back down without necessarily losing face. At any rate, North Korea has a history of making threats that it fails to follow through on. The stability-instability paradox was a concept developed during the Cold War to explain how two states can achieve stability at the strategic level through mutually assured destruction but, as a consequence, simultaneously be even freer to pursue small-scale and seemingly low-stakes conflicts like provocations and proxy wars. The odds of a nuclear holocaust were thought to approach zero while low-intensity conflicts became a recurring phenomenon. As North Korea’s nuclear capability improves, the logic of the stability-instability paradox becomes more compelling. Even without delivery vehicles for North Korea’s nuclear capability, some believe that the stability-instability paradox has already reached the Korean Peninsula due to the capacity of both sides to inflict unimaginable atrocities on the other through conventional weapons alone. In short, while there may be incentives for conflict by either side, both sides also have even more compelling incentives to limit the scope of any violence. There are, of course, many chances for miscalculation—especially during a crisis—but there’s no conceivable miscalculation that would reasonably lead to total war without lots of intervening steps and assumptions in between the miscalculation and the nightmare outcome. And if we reason from a place of likelihoods rather than from a place of what’s hypothetically possible, we stand a chance of crafting better policy. The structural constraints discussed above and elsewhere will remain for the foreseeable future. If the alliance is unwilling to pursue a conciliatory or appeasement approach to North Korea, then it will stay on the path of limited war, raising the question whether it’s willing to remain blind to emerging conditions or begin preparing today for what may come tomorrow. Last week’s crisis was a warning shot.